Soft berries are now in season. Need I say more? Strawberries and raspberries in the shops herald the start of Birthday season in our house, with more than 5 Birthdays in the month of June it’s a busy month. 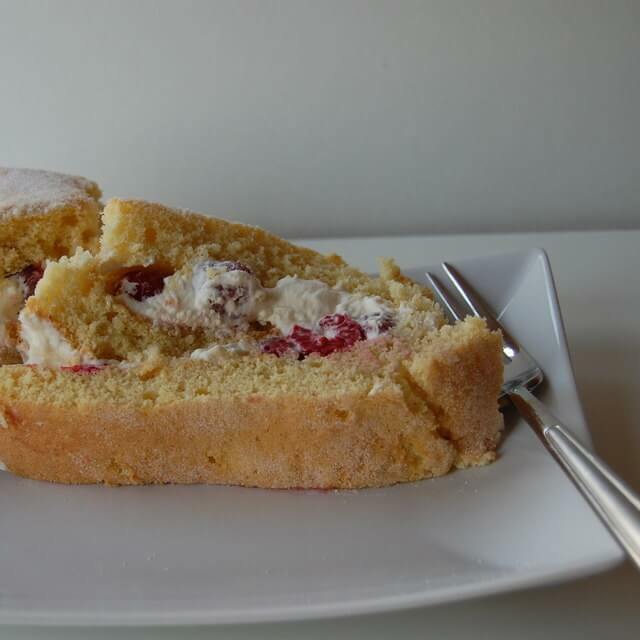 For that reason it’s always good to have a fail safe cake recipe that doesn’t take long to make, works well with berries and doesn’t make you feel too guilty for eating yet another slice of cake. This is a fatless sponge recipe that works so well for me because it is simple to scale the size up or down. The measurements below make 2 small sandwich tins of cake or 1 cookie tray of cake which can be rolled into a swiss roll. The most important thing you need to remember is the ratio which is 1:1:1 – I remember this because it’s the way my Grandmother taught me to make a sponge and for this reason my measurements are in the old, imperial measurements. Line your sandwich tins with baking parchment. Take another large piece of baking parchment & place the sieve on top of it. Put the flour & baking powder inside the sieve & leave it for the time being. Put the eggs and sugar into the mixer and using the whisk attachment whisk until pale, light and fluffy. Its volume should at least double in size. Turn off the mixer and sieve the flour/baking powder directly onto the baking parchment. Now gently pour half the flour into the egg/sugar mixture and fold with the metal spoon. Taking care not to knock the air out. Repeat step 6 above with the remaining flour. Divide the mixture between the 2 lined sandwich tins. Bake in the oven for approximately 17 mins or until golden. Remove from the oven when baked and leave to cool on a cooling rack, then fill the sandwich with fresh cream and berries. Serve immediately and it is best eaten on the day it is baked.